Who doesn't love a chocolate cake? Although chocolate cakes are amazing, they can sometimes, if not often, be a little dry. And while for some, the chocolatey icing compensates for the possible dryness of the cake, I'm not that partial to eating a thick layer of icing in-between and on top of a cake (though it does look impressive!). My ideal cake is one that is moist, simple, with no icing (maybe a sprinkle of icing sugar) that is complimented with some vanilla cream and perhaps some fresh fruit on the side. I found this gorgeous recipe in Nigella Lawson's cookbook, Nigellissima. I recently borrowed this book from my local library (the library has become my recent discovery, as it's the perfect way to try out cookbooks before buying them! 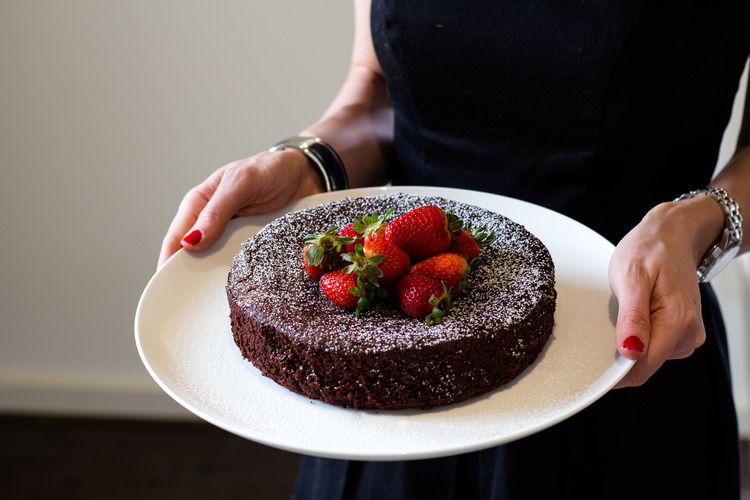 ), and I came across her recipe for Chocolate Olive Oil Cake. This cake is deliciously moist, and although it's rich and chocolatey, its not a heavy cake to eat. The use of almond meal means that its perfect for anyone who is gluten-free as well! This cake is perfect served slightly warm, with a dollop of cream or ice-cream and some strawberries, or fresh raspberries on the side. ˚C. Grease a 22cm springform cake tin with oil and line the base with baking paper. 2. Sift the cocoa powder into a small bowl and whisk in the boiling water until you have a smooth, and slightly runny paste (you may need to add a little extra water). Stir in the vanilla extract, then set aside to cool slightly. 3. In another bowl, combine the almond meal (or flour) with the bicarb soda and salt. 4. Put the sugar, olive oil and eggs into the bowl and beat together on a high speed for about 3 minutes until you have a pale and thick consistency. 5. Turn the speed down and pour in the cocoa mixture, beating as you go. Once this is combined, slowly tip in the almond meal (or flour) mixture. 6. Scrape edges of bowl with a spatula and stir a little so it's all combined. Pour into the prepared tin and bake for 40-45 minutes or until the sides are set. The very centre of the cake should still look slightly damp. A skewer should come out mainly clean when inserted into the middle of the cake. 7. Let the cake cool for 10 minutes on a wire rack, still in its tin, then remove from tin and leave to cool completely, or serve warm with cream or ice-cream.